Sawtooth National Forest is a National Forest that covers 2,110,408 acres (854,052 ha) in the U.S. states of Idaho (~96 percent) and Utah (~4 percent). 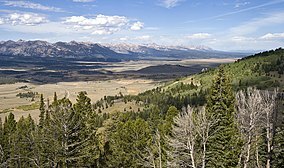 Managed by the U.S. Forest Service in the U.S. Department of Agriculture, it was originally named the Sawtooth Forest Reserve in a proclamation issued by President Theodore Roosevelt on May 29, 1905. 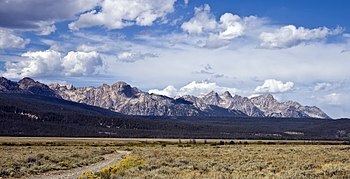 On August 22, 1972 a portion of the forest was designated as the Sawtooth National Recreation Area (SNRA), which includes the Sawtooth, Cecil D. Andrus–White Clouds, and Hemingway–Boulders wilderness areas. The forest is managed as four units: the SNRA and the Fairfield, Ketchum, and Minidoka Ranger Districts. Sawtooth National Forest is named for the Sawtooth Mountains, which traverse part of the SNRA. The forest also contains the Albion, Black Pine, Boise, Boulder, Pioneer, Raft River, Smoky, Soldier, Sublett, and White Cloud mountain ranges, as well as Hyndman Peak, the ninth-highest point in Idaho at 12,009 feet (3,660 m) above sea level. Sawtooth National Forest contains land cover types which include sagebrush steppe, spruce-fir forests, alpine tundra, and over 1,100 lakes and 3,500 miles (5,600 km) of rivers and streams. Plants and animals found only in the Sawtooth National Forest and adjacent lands include Christ's Indian paintbrush, Davis' springparsley, the South Hills crossbill, and the Wood River sculpin. The mountains of Sawtooth National Forest have a varied geological history. The northern Sawtooth Mountains formed from the Eocene Sawtooth batholith, while south of Alturas Lake the Sawtooth, Smoky, and Soldier mountains formed from the Cretaceous granodiorite of the Idaho Batholith. Foothills of the Smoky Mountains are from the Pennsylvanian and Permian Dollarhide formations. The White Cloud Mountains are underlain by the gray granodiorite of the Idaho batholith, while some of the exposed rock is baked impure limestone from the Permian Grand Prize Formation. Much of Sawtooth National Forest receives less than 15 inches (38 cm) of precipitation a year, with higher elevations typically receiving more precipitation. Summer and early fall are usually drier than winter in most of the forest, while in the lowlands of the Minidoka District, such as near Oakley, the spring may be the wettest season. Winter snowfall provides a steady water supply to the streams during the summer. Locally, climate may depend on mountains that block moist air and river valleys that can funnel weather systems. Dry lightning is common in summer and fall. The growing season ranges from 150 days in the lower valleys to less than 30 days in the highest alpine areas. :I-8 The climate charts below are ordered (left to right) from highest to lowest in both latitude and elevation. ^ a b c d e f g h i j Sawtooth National Forest (Map) (1998 ed.). 1:126,720. Sawtooth National Forest, U.S. Forest Service. ^ a b c d e f g h i j k l "Sawtooth National Forest Visitor Guide" (PDF). U.S. Forest Service. Archived from the original (PDF) on February 12, 2013. Retrieved May 9, 2012. ^ a b c d e f g h i j k l m n o p q r s t u v "Sawtooth National Forest". U.S. Forest Service. Retrieved May 9, 2012. ^ "Land Areas of the National Forest System" (PDF). U.S. Forest Service. November 2015. Archived from the original (PDF) on January 16, 2016. Retrieved January 16, 2016. ^ a b "National Visitor Use Monitoring Results for Sawtooth National Forest". U.S. Forest Service. September 2006. Archived from the original on February 12, 2013. Retrieved June 12, 2012. ^ Steen, Harold K. (May 1991). "Reserve Act and Congress: Passage of the 1891 Act". The Beginning of the National Forest System. Washington, DC: U.S. Forest Service. pp. 18–23. Archived from the original on February 12, 2013. Retrieved December 17, 2012. ^ "The U.S. Forest Service – An Overview" (PDF). U.S. Forest Service. p. 2. Archived from the original (PDF) on February 12, 2013. Retrieved December 17, 2012. ^ a b c d "The National Forests of the United States" (PDF). Forest History Society. Retrieved May 10, 2012. ^ a b Godfrey, Anthony (February 15, 2004). "From Burley to Hailey, Idaho: Administrative Facilities of the Sawtooth National Forest, 1891–1960". U.S. Forest Service. ^ a b c d e f Dant Ewert, Sara E. (Summer 2000). "Peak park politics: the struggle over the Sawtooths, from Borah to Church". The Pacific Northwest Quarterly. 91 (3): 138–149. ISSN 0030-8803. JSTOR 40492581. ^ a b c d e Osborn, John (1979). "Creating the Sawtooth National Recreation Area, Protecting Wilderness". Archived from the original on February 12, 2013. Retrieved October 8, 2012. ^ "Sawtooth bill is introduced". Lewiston Morning Tribune. (Idaho). Associated Press. April 29, 1967. p. 3. ^ a b "New 755,000-acre Idaho recreation area created". The Bulletin. Bend, OR. August 26, 1972. p. 14. Retrieved May 11, 2012. ^ Mattingly, Phil (March 23, 2018). "Idaho senator holds up bill over political rivalry with deceased governor". CNN. Retrieved March 24, 2018. ^ Dao, Elaine (April 3, 2018). "Sawtooth National Forest headquarters move to Jerome after 32 years in Twin Falls". KMVT. Retrieved April 10, 2018. ^ "Transportation Observation, Considerations, and Recommendations for Sawtooth National Recreation Area" (PDF). National Transportation Library. p. 2. Archived from the original (PDF) on February 12, 2013. Retrieved May 9, 2012. ^ "BLM 1:100K Maps | Land Status | Counties" (PDF). Public Lands Information Center. Archived from the original (PDF) on February 12, 2013. Retrieved August 25, 2012. ^ a b c d e f g h i j k l m n o p q r s t u v w x y z aa ab ac ad "2012 Amended Forest Plan". Sawtooth National Forest. 2012. Retrieved October 13, 2012. ^ "Wilderness Acreage Breakdown for The Sawtooth Wilderness". Wilderness.net. Archived from the original on February 12, 2013. Retrieved July 7, 2012. ^ "Control of Emissions from Marine SI and Small SI Engines, Vessels, and Equipment" (PDF). United States Environmental Protection Agency. September 2008. Archived from the original (PDF) on April 16, 2014. Retrieved May 11, 2012. ^ "Sawtooth Wilderness". Wilderness.net. Archived from the original on February 12, 2013. Retrieved May 10, 2012. ^ Landers, Rich (August 4, 2015). "Idaho's Boulder White-Clouds Wilderness Approved". The Spokesman-Review. Archived from the original on August 4, 2015. ^ Simpson, Mike. "H.R. 1138" (PDF). U.S. Congress. Archived from the original (PDF) on August 4, 2015. ^ "Wilderness Area Proposals" (PDF). U.S. Congress. February 23, 2015. Archived from the original (PDF) on August 4, 2015. Retrieved August 4, 2015. ^ Ridler, Keith (August 7, 2015). "President signs legislation creating new Idaho wilderness". Associated Press. Archived from the original on August 8, 2015. Retrieved August 8, 2015. ^ Simpson, Mike. "An Idaho Solution to Idaho Land Management". U.S. House of Representatives. Archived from the original on February 12, 2013. Retrieved May 3, 2012. ^ Crapo, Mike (June 2, 2011). "CIEDRA". U.S. Senate. Archived from the original on February 12, 2013. Retrieved May 3, 2012. ^ a b "Sawtooth Group". Sierra Club Idaho Chapter. Archived from the original on February 12, 2013. Retrieved May 3, 2012. ^ "Sawtooth National Recreation Area and Jerry Peak Wilderness Additions Act" (PDF). U.S. House of Representatives. Archived from the original (PDF) on February 1, 2015. Retrieved January 31, 2015. ^ Rasker, Ray (2005). "Wilderness for its own sake or as economic asset?". Journal of Land, Resources, & Environmental Law. 15. ^ "Why the Boulder-White Clouds? Why Now?". Idaho Conservation League. Archived from the original on April 22, 2013. Retrieved April 21, 2013. ^ Barker, Rocky (April 14, 2013). "New life for Idaho treasures as national monuments?". Idaho Statesman. Archived from the original on April 22, 2013. Retrieved April 21, 2013. ^ Maloney, Carolyn B. (November 29, 2011). "H.R. 3334 Northern Rockies Ecosystem Protection Act". Washington, DC: Library of Congress. Archived from the original on February 12, 2013. Retrieved May 21, 2012. ^ Power, Thomas Michael (February 2000). "Making a Case for Wilderness in the Community: It's Good Business" (PDF). The Economics of Wildland Preservation: excerpt from a report prepared for the PEW Wilderness Center. Helena, MT: University of Montana. pp. 23–27. Archived from the original (PDF) on June 16, 2010. Retrieved May 21, 2012. ^ Zahniser, Howard (September 3, 1964). "The Wilderness Act" (PDF). Washington, DC: U.S. Congress. Archived from the original (PDF) on February 12, 2013. Retrieved May 22, 2012. ^ "The Wilderness Act of 1964". Wilderness.net. Archived from the original on February 12, 2013. Retrieved May 20, 2012. ^ Kershner, Bruce; Mathews, Daniel; Nelson, Gil; Spellenberg, Richard; Purinton, Terry; Block, Andrew; Moore, Gerry; Thieret, John W. (2008). National Wildlife Federation Field Guide to Trees of North America. New York, NY: Sterling Publishing Company. ISBN 978-1-4027-3875-3. ^ Perkins, Dana L.; Swetnam, Thomas W. (December 1996). "A dendroecological assessment of whitebark pine in the Sawtooth-Salmon River region, Idaho" (PDF). Canadian Journal of Forest Research. 26 (12): 2123–2133. doi: 10.1139/x26-241. ISSN 1208-6037. Archived from the original (PDF) on February 13, 2013. ^ Tausch, Robin J.; West, Neil E.; Nabi, A. A. (July 1981). "Tree age and dominance patterns in Great-Basin pinyon-juniper woodlands" (PDF). Journal of Range Management. 34 (4): 259–264. doi: 10.2307/3897846. ISSN 0022-409X. JSTOR 3897846. Archived from the original (PDF) on February 13, 2013. ^ a b Moseley, Robert K. (October 1993). "The status and distribution of Christ's Indian paintbrush (Castilleja christii) and Davis' wavewing (Cymopterus davisii) in the Albion Mountains, Sawtooth National Forest and City of Rocks National Reserve" (PDF). Idaho Department of Fish and Game. Archived from the original (PDF) on February 12, 2013. Retrieved May 22, 2012. ^ Holmgren, Noel H. (March–April 1973). "Five new species of Castilleja (Scrophulariaceae) from the Intermountain Region". Bulletin of the Torrey Botanical Club. 100 (2): 83–93. ISSN 1095-5674. JSTOR 2482396. ^ Moseley, Robert K. (April 1996). "Christ's Indian paintbrush (Castilleja christii) monitoring on the Sawtooth National Forest: transect establishment and baseline data" (PDF). Idaho Department of Fish and Game. Archived from the original (PDF) on February 12, 2013. Retrieved May 22, 2012. ^ Pierson, Kim (October 13, 2010). "Plant of the Week: Christ's Indian Painbrush". U.S. Forest Service. Archived from the original on February 12, 2013. Retrieved May 9, 2012. ^ Hartman, Ronald L. (January–March 1985). "A new species of Cymopterus (Umbelliferae) from southern Idaho". Brittonia. 37 (1): 102–105. doi: 10.2307/2806254. ISSN 0007-196X. JSTOR 2806254. ^ Logan, Jesse A. "Climate change induced invasions by native and exotic pests" (PDF). Logan, UT: U.S. Forest Service, Rocky Mountain Research Station. Archived from the original (PDF) on February 12, 2013. Retrieved May 9, 2012. ^ a b Groves, Craig R.; Butterfield, Bart; Lippincott, Abigail; Csuti, Blair; Scott, J. Michael (1997). Atlas of Idaho's Wildlife (PDF). Boise, ID: Idaho Department of Fish and Game. ISBN 978-0-9657756-0-1. Archived from the original (PDF) on February 12, 2013. ^ a b Harvey, Jacqueline (1999). "Sawtooth National Forest". Idaho Museum of Natural History, Idaho State University. Archived from the original on February 12, 2013. Retrieved May 9, 2012. ^ Merrill, Troy; Mattson, David J.; Wright, R. Gerald; Quigley, Howard B. (February 1999). "Defining landscapes suitable for restoration of grizzly bears Ursus arctos in Idaho" (PDF). Biological Conservation. 87 (2): 231–248. doi: 10.1016/S0006-3207(98)00057-3. ISSN 0006-3207. Archived from the original (PDF) on February 13, 2013. ^ Smith, Rob Roy (2003). "Unbearable? Bitterroot Grizzly Bear Reintroduction & the George W. Bush Administration". Golden Gate University Law Review. Berkeley, CA: Berkeley Electronic Press. 33 (3). Archived from the original on February 12, 2013. Retrieved May 11, 2012. ^ "Grizzly Bears Will Not Be Reintroduced into U.S. West". Environment News Service. June 21, 2001. Archived from the original on February 12, 2013. Retrieved May 11, 2012. ^ "Nature final plan afoot to reintroduce grizzly bears". CNN. March 15, 2000. Archived from the original on February 12, 2013. Retrieved May 11, 2012. ^ a b c d e Alden, Peter; Grassy, John; Cassie, Brian; Kahl, Jonathan D. W.; Leventer, Amy; Mathews, Daniel; Zomlefer, Wendy B. (1998). National Audubon Society Field Guide to the Rocky Mountain States (1st ed.). New York, NY: Alfred A. Knopf. ISBN 978-0-679-44681-1. ^ Isaak, Dan; Rieman, Bruce; Horan, Dona (April 2009). "A watershed-scale monitoring protocoal for bull trout" (PDF). Fort Collins, CO: Rocky Mountain Research Station, U.S. Forest Service. Archived from the original (PDF) on February 12, 2013. Retrieved May 21, 2012. ^ "Focus: Bull Trout Monitoring" (PDF). Rocky Mountain Research Station. Archived from the original (PDF) on February 12, 2013. Retrieved May 11, 2012. ^ "Salvelinus confluentus". Integrated Taxonomic Information System. Retrieved May 12, 2012. ^ Froese, Rainer and Pauly, Daniel, eds. (2012). "Salvelinus confluentus" in FishBase. May 2012 version. ^ "Bull Trout Facts (Salvelinus confluentus)" (PDF). U.S. Fish and Wildlife Service. May 1998. Archived from the original (PDF) on February 12, 2013. Retrieved May 21, 2012. ^ "Bull Trout (Salvelinus confluentus)". U.S. Fish and Wildlife Service. Archived from the original on February 12, 2013. Retrieved May 10, 2012. ^ "Success at Redfish Lake". Northwest Fisheries Science Center. December 12, 2008. Archived from the original on February 12, 2013. Retrieved June 22, 2012. ^ Kunz, Aaron (September 16, 2011). "Idaho Sockeye Salmon Count Exceeds Expectations". KPLU.org. Archived from the original on February 12, 2013. Retrieved June 22, 2012. ^ Ridler, Keith (September 18, 2014). "Salmon numbers jump at Redfish Lake". Associated Press. Archived from the original on September 19, 2014. Retrieved September 19, 2014. ^ Griswold, Robert G.; Taki, Doug; Stockner, J. G. (2003). Redfish Lake Sockeye salmon: nutrient supplementation as a means of restoration. Nutrients in Salmonid ecosystems: sustaining production and biodiversity. American Fisheries Society Symposium. 34. Bethesda, MD: American Fisheries Society. pp. 197–211. ISBN 978-1-888569-44-5. ISSN 0892-2284. ^ Kauffman, Jason (April 18, 2008). "First salmon season in 31 years?". Idaho Mountain Express. , Ketchum, ID. Archived from the original on February 12, 2013. Retrieved May 9, 2012. ^ "Wood River Sculpin". American Fisheries Society Idaho Chapter. Archived from the original on February 12, 2013. Retrieved May 20, 2012. ^ Gimenez, Dixon, M. (1996). "Cottus leiopomus". IUCN Red List of Threatened Species. Archived from the original on February 12, 2013. Retrieved May 20, 2012. ^ "Birds of the Upper Salmon Basin Checklist". Idaho Department of Fish and Game. ^ Peterson, Roger Tory (2008). Peterson Field Guide to Birds of North America (1st ed.). New York, NY: Houghton Mifflin Company. ISBN 978-0-618-96614-1. ^ "Interagency Special Status / Sensitive Species Program (ISSSSP)". U.S. Forest Service & Bureau of Land Management. June 28, 2011. Archived from the original on February 12, 2013. Retrieved May 11, 2012. ^ Benkman, Craig W.; Smith, Julie W.; Keenan, Patrick C.; Parchman, Thomas L.; Santisteban, Leonard (February 2009). "A New Species of the Red Crossbill (Fringillidae: Loxia) From Idaho" (PDF). The Condor. 111 (1): 169–176. doi: 10.1525/cond.2009.080042. ISSN 0010-5422. Archived from the original (PDF) on February 12, 2013. Retrieved May 21, 2012. ^ Smith, Julie W.; Benkman, Craig W. (April 2007). "A coevolutionary arms race causes ecological speciation in crossbills". The American Naturalist. 169 (4): 455–465. doi: 10.1086/511961. ISSN 0003-0147. JSTOR 511961. PMID 17273981. ^ "2009-A-10:Recognize a new species of Red Crossbill, Loxia sinesciurus (Benkman)". American Ornithologists' Union. Archived from the original on February 13, 2013. Retrieved May 10, 2012. ^ Whitlock, Cathy; Briles, Christy E.; Fernandez, Matias C.; Gage, Joshua (2011). "Holocene vegetation, fire and climate history of the Sawtooth Range, central Idaho, USA". Quaternary Research. 75 (1): 114–124. Bibcode: 2011QuRes..75..114W. doi: 10.1016/j.yqres.2010.08.013. ISSN 0033-5894. ^ Kauffman, Jason (31 August 2007). "Castle Rock Fire battle ends where it began". Idaho Mountain Express. Ketchum, ID. Archived from the original on February 12, 2013. Retrieved February 5, 2012. ^ Wutz, Katherine (August 27, 2010). "Still scarred – but new life emerges". Idaho Mountain Express. Ketchum, ID. Archived from the original on February 12, 2013. Retrieved February 5, 2012. ^ Tuohy, Jennfier (June 13, 2007). "Learn about the big burn: SNRA program reveals Valley Road Fire benefited the forest". Idaho Mountain Express. Ketchum, ID. Archived from the original on February 12, 2013. Retrieved May 22, 2012. ^ "Beaver Creek Fire". InciWeb. Archived from the original on March 1, 2014. Retrieved March 1, 2014. ^ "Kelley Fire". InciWeb. Archived from the original on March 1, 2014. Retrieved March 1, 2014. ^ "McCan Fire". InciWeb. Archived from the original on March 1, 2014. Retrieved March 1, 2014. ^ "USFS Aerial Fire Retardant Avoidance: Sawtooth National Forest" (PDF). U.S. Forest Service. Archived from the original (PDF) on February 12, 2013. Retrieved December 17, 2012. ^ "South Central Idaho Interagency Dispatch Center". Bureau of Land Management. Archived from the original on February 12, 2013. Retrieved October 13, 2012. ^ "Our View: Mount Harrison's Lookout is Worth Preserving". Times-News. Twin Falls, Idaho. April 4, 2012. Archived from the original on February 12, 2013. Retrieved October 15, 2012. ^ a b Lopez, T. (October 1, 2000). Idaho, a climbing guide: climbs, scrambles, and hikes (2nd ed.). Seattle, WA: Mountaineers Books. ISBN 978-0-89886-608-7. ^ "The Complete Sawtooths List". SummitPost.org. Retrieved May 10, 2012. ^ Taubeneck, William H. (July 1971). "Idaho batholith and its southern extension". GSA Bulletin. 82 (7): 1899–1928. doi: 10.1130/0016-7606(1971)82[1899:IBAISE]2.0.CO;2. ISSN 1943-2674. ^ "Idaho Batholith" (PDF). Idaho State University. Archived from the original (PDF) on February 12, 2013. Retrieved May 9, 2012. ^ Houseman, Richard M.; Baumann, Richard W. (1997). "Zoogeographic affinities of the stoneflies (Plecoptera) of the Raft River Mountains, Utah". Great Basin Naturalist. Provo, UT: Brigham Young University. 57 (3): 209–219. Archived from the original on February 12, 2013. Retrieved May 21, 2012. ^ Cook, Kenneth L.; Halverson, Mark O.; Stepp, J. C.; Berg, Jr., Joseph W. (1964). "Regional gravity survey of the northern Great Salt Lake Desert and adjacent areas in Utah, Nevada, and Idaho". GSA Bulletin. 75 (8): 715–740. doi: 10.1130/0016-7606(1964)75[715:RGSOTN]2.0.CO;2. ISSN 0016-7606. ^ Roberts, Ralph J.; Critten, M. D.; Tooker, E. W.; Morris, H. T.; Hose, R. K.; Cheney, T. M. (1965). "Pennsylvanian and Permian Basins in northwestern Utah, northeastern Nevada and south-central Idaho". AAPG Bulletin. 49: 1926–1956. ^ Blatt, Harvey; Tracy, Robert J. (1996). Petrology: Igneous, Sedimentary, and Metamorphic (2nd ed.). New York, NY: W. H. Freeman and Company. pp. 345–349. ISBN 978-0-7167-2438-4. ^ "Galena Summit". Idaho Transportation Department. Archived from the original on February 12, 2013. Retrieved May 10, 2012. ^ "Banner Creek Summit". Idaho Transportation Department. Archived from the original on February 12, 2013. Retrieved May 10, 2012. ^ "Redfish FAQ". Redfish Lake Lodge. Archived from the original on February 12, 2013. Retrieved May 9, 2012. ^ "Scientists find new seismic fault in Rocky Mountains". BBC News. May 20, 2012. Archived from the original on February 12, 2013. Retrieved November 20, 2010. ^ Wall, Tim (November 19, 2010). "Large Seismic Fault Found in the Rockies". Discovery News. Archived from the original on February 12, 2013. Retrieved November 20, 2010. ^ Cannon, Charles (August 24, 2011). "Glaciers of Idaho". Portland State University. Archived from the original on February 12, 2013. Retrieved May 9, 2012. ^ a b Thackray, Glenn D.; Lundeen, Kari A.; Borgert, Jennifer A. (March 2004). "Latest Pleistocene alpine glacier advances in the Sawtooth Mountains, Idaho, USA: reflections of midlatitude moisture transport at the close of the last glaciation". Geology. 32 (3): 225–228. Bibcode: 2004Geo....32..225T. doi: 10.1130/G20174.1. ISSN 1943-2682. ^ Mijal, Brandon (2008). "Holocene and latest Pleistocene glaciation in the Sawtooth Mountains, central Idaho". Bellingham, WA: Western Washington University. ^ "Idaho Climate Summaries". Western Regional Climate Center. Archived from the original on February 12, 2013. Retrieved May 9, 2012. ^ "Stanley, Idaho- Climate Summary". Western Regional Climate Center. Archived from the original on February 12, 2013. Retrieved December 17, 2012. ^ "Ketchum, Idaho- Climate Summary". Western Regional Climate Center. Archived from the original on February 12, 2013. Retrieved December 17, 2012. ^ "Fairfield, Idaho- Climate Summary". Western Regional Climate Center. Archived from the original on February 12, 2013. Retrieved December 17, 2012. ^ "Oakley, Idaho- Climate Summary". Western Regional Climate Center. Archived from the original on February 12, 2013. Retrieved December 17, 2012. ^ "Sawtooth". National Forest Foundation. Archived from the original on February 12, 2013. Retrieved May 9, 2012. ^ Dary, David (November 9, 2004). The Oregon Trail: An American Saga (1st ed.). New York, NY: Random House. p. 24. ISBN 978-0-375-41399-5. 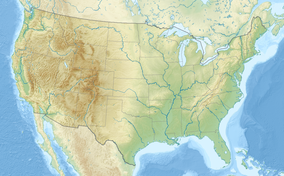 ^ "Oregon National Historic Trail Map". National Park Service. Retrieved October 22, 2012. ^ a b c Conley, Cort (June 1, 2003). Idaho for the Curious (1st ed.). Backeddy Books. ISBN 978-0-9603566-3-8. ^ Park, William A. (1990). The geology and ore deposits of the Rook's Creek stock, Blaine County Idaho (PDF) (MS). Idaho State University. Archived from the original (PDF) on February 13, 2013. Retrieved May 22, 2012. ^ Umpleby, Joseph B. (1914). "Ore deposits in the Sawtooth Quadrangle, Blaine and Custer counties, Idaho" (PDF). USGS. Archived from the original (PDF) on February 12, 2013. Retrieved May 22, 2012. ^ Ellsworth, John C. (1996). "Computer visual simulations and surface mine closure studies". British Columbia Mine Reclamation Symposium 1996. University of British Columbia. Archived from the original on February 12, 2013. Retrieved May 21, 2012. ^ Ream, Lanny R. (1995). "Idaho: Mineral Locality Index". Rocks and Minerals. 70 (4): 242–263. doi: 10.1080/00357529.1995.9926628. ^ a b "Black Pine Mine: Sawtooth National Forest" (PDF). U.S. Forest Service. Archived from the original (PDF) on October 25, 2011. Retrieved May 10, 2012. ^ "History". Ketchum/Sun Valley Historical Society. Archived from the original on February 12, 2013. Retrieved May 9, 2012. ^ Sudweeks, Leslie L. (July 1941). "The Raft River in Idaho history". The Pacific Northwest Quarterly. 32 (3): 289–305. ISSN 0030-8803. JSTOR 40486471. ^ "On The Front Lines In Wolf Country, Peruvian Herders Keep 'Los Lobos' At Bay". Northwest News Network. October 24, 2011. Archived from the original on February 12, 2013. Retrieved January 18, 2013. ^ Barnes, Bingo (July 27, 2005). "A Trip Through Basque Sheep Country". Boise Weekly. Archived from the original on February 12, 2013. Retrieved January 18, 2013. ^ Douglass, William A. "Basque Sheepherding" (PDF). Archived from the original (PDF) on February 12, 2013. Retrieved January 18, 2013. ^ Holland, Wendolyn Spence (1998). Sun Valley: an extraordinary history. Ketchum, ID: Idaho Press. ISBN 978-1-56044-587-6. ^ Gilroy, Harry (August 23, 1966). "Widow Believes Hemingway Committed Suicide; She Tells of His Depression and His 'Breakdown' Assails Hotchner Book". The New York Times. p. 36. ISSN 0362-4331. Archived from the original on February 12, 2013. Retrieved May 21, 2012. ^ Dayley, Lisa (January 5, 2011). "WWII Bomber Crash on Mt. Harrison". Burley, ID: Weekly New Journal. Archived from the original on February 12, 2013. Retrieved May 10, 2012. ^ "Sawtooth National Forest: Forest Information". U.S. National Forest Campground Guide. Archived from the original on February 12, 2013. Retrieved May 9, 2012. ^ "Recreation.gov". Recreation.gov. Retrieved May 11, 2012. ^ "Idaho Department of Fish and Game". Idaho Department of Fish and Game. Retrieved May 9, 2012. ^ "Current Conditions". United States Geological Survey. Retrieved August 11, 2012. ^ "Redfish Lake Lodge". Redfish Lake Lodge. Archived from the original on February 12, 2013. Retrieved October 13, 2012. ^ Schmidt, Thomas. "Road Trip: The Sawtooths, Idaho". National Geographic. Archived from the original on February 12, 2013. Retrieved October 13, 2012. ^ Moseley, Robert K. (December 1995). "The Ecology of Geothermal Hot Springs in South-Central Idaho" (PDF). Idaho Department of Fish and Game. Archived from the original (PDF) on February 12, 2013. Retrieved October 13, 2012. ^ Mohlenbrock, Robert H. (2006). This Land: A Guide to Western National Forests. Berkeley, CA: University of California Press. pp. 193–196. ISBN 978-0-520-23967-8. ^ "Galena Lodge". Galena Lodge. Archived from the original on February 12, 2013. Retrieved May 11, 2012. ^ "Guided Backcountry Trips - Hut & Yurt Rentals". Sun Valley Trekking. Retrieved 2017-04-14. ^ "Ski Areas in Idaho". Idaho Ski Resorts. Archived from the original on March 2, 2001. Retrieved May 11, 2012. ^ "Idaho Scenic Byways". Idaho Scenic Byways. Retrieved May 9, 2012. ^ Dugan, Dana (December 18, 2002). "Sun Valley films: a match made in celluloid heaven". Idaho Mountain Express. Ketchum, ID. Archived from the original on February 12, 2013. Retrieved May 22, 2012. ^ Lund, Mort (December 1, 1958). "High, White And Wonderful". Sports Illustrated. Archived from the original on February 12, 2013. Retrieved January 18, 2013. ^ Eastwood, Clint (Director, producer) (June 26, 1985). Pale Rider (film). Warner Bros.
^ Murray, Thomas C. (March 2004). The Official License Plate Book. Mill Neck, NY: Interstate Directory Publishing Company. ISBN 978-1-886777-07-1. Wikimedia Commons has media related to Sawtooth National Forest.